This would have been a five star read if the author were trying to write the book as required reading in a science class. 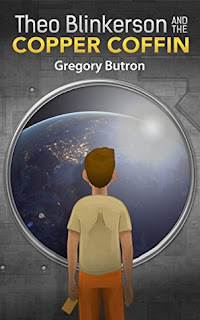 Filled with techno-speak, which helps get into the mindset of the other characters, I think the author does a wonderful job at narrating the story through the eyes of the main character, Theo. Theo is funny and snarky. He’s not as technically savvy as Dave, which makes me relate to him. His way of seeing the world is enlightening. His thoughts are silly and yet true. It brings to mind the phrase: “Out of the mouths of babes” and reminds me that children see more than we give them credit for. Full of action, adventure, and interesting characters, I appreciated Theo had a great moral compass and his dislike toward discussing emotions doesn’t hide the fact he has a lot of compassion. The other characters are quirky and all have secrets – some revealed and some yet to come to light. Watching Theo negotiate this terrain was a joy. This is a cautionary tale of how important it is to understand how the many tools work and not just use them blindly. It also speaks to growing up and fighting for what you believe in. I think it would appeal to both boys and girls of say ten years old and up. Some of the jargon may be difficult for younger readers, because of vocabulary, and not because of content. I laughed a lot while reading this and hope, as the author promises at the cliff-hanging end, that there are more stories to come.